Date of birth unknown. He started his career at the end of the Kyôhô era and his first pen name was Chigusa Eisuke. He worked in Ôsaka in the 12th lunar month of 1736 on the drama "Nichô no Yumi Katsuragi Kassen", which was produced by Iwai Hanshirô III. He became disciple of Namiki Sôsuke and received the name of Namiki Eisuke in the 11th lunar month of 1737 in Ôsaka at the Kado no Shibai, where he worked on the kiri kyôgen "Meoto Boshi Ukina no Tenjin". He went to Kyôto in Fall 1744 and worked on the kaomise drama "Tanba Yosaku Kameyama Kayoi", which was produced by Nakamura Kumetarô I. He went back to Ôsaka in the 2th lunar month of 1744 to work with Matsuya Kyûemon on the drama "Ishibashiyama Yoroi Zakura". He went back to Kyôto the same year to work in the 5th lunar month, along with Nakamura Gohachi and Sawamura Ayasuke, on the drama "Enshoku Ukina no Ezôshi". He went back the same year to Ôsaka in the 7th lunar month of 1744 to work with Matsuya Kyûemon  on the summer drama "Yuri Wakadaijin Oki no Kamome". He went back to Kyôto the same year to work in the 11th lunar month to work  at the Minamigawa no Shibai on the kaomise drama "Meiken Kogane Zukuri". He went back to Ôsaka in the 3rd lunar month of 1751 to work with Takagi Richû on the drama "Sannin Musume Keizu Hachinoki" which was produced by Nakamura Jûzô I at the Naka no Shibai. He also worked in Ôsaka as a puppet theater sakusha from the first half of the 1750s. He worked at the Kado no Shibai as a nimaime sakusha for the tatesakusha Namiki Shôzô I on the summer drama "Kusatsu Kojorô". He went back to Kyôto in Fall 1758 and worked in the 11th lunar month of 1758 at the Minamigawa no Shibai on the kaomise drama "Homare Musha Senri no Kachidoki", which was produced by Sawamura Kunitarô I and Somematsu Matsujirô. He went back to Ôsaka in Fall 1762 and worked as a tatesakusha at the Kado no Shibai on the kaomise drama "Hachinoki Nendaiki", which was produced by Nakayama Bunshichi I and celebrated the shûmei of Arashi Sanjûrô III. He was active in Ôsaka, either in the puppet theater or in Kabuki, up to the summer of 1770. Eisuke was the master of Namiki Jusuke, Namiki Eisuke II and Haruki Motosuke. He was also called Wataya Jiemon ( ) as he was most likely born in a cotton merchants family (wataya) in Ôsaka. He died in 1771. There will be in the future to come a full page dedicated to Namiki Eisuke I in kabuki21.com. Dates of birth and death unknown. Disciple of Namiki Eisuke I, he took the name of Namiki Eisuke II at an unknown date, after the passing away of his master. Period of activity unknown. 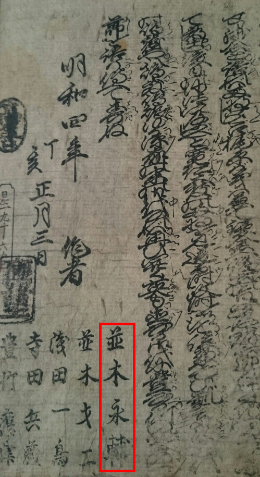 He was recorded working as a sakusha in Kamigata in 1786. No record afterwards. Others sakusha were Nakata Gohachi and Matsuya Yûsuke. Others sakusha were Hirano Yoshibei, Nakata Gohachi and Awa Kyôsuke.